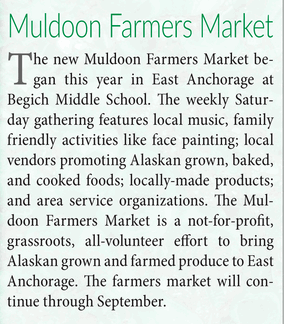 We welcome the Alaska Division of Agriculture to our Muldoon Farmers Market, 9:30 – 2:30 Saturday, July 1, at Begich Middle School, to promote their “Meet Me at the Market” campaign. Stop by the Alaska Grown booth for free tote bags, bumper stickers, etc. 7440 Creekside Center Drive. This entry was posted in event and tagged Alaska Grown, Eat Alaska. Bookmark the permalink.